>> Right as we fell down the rabbit hole of work about six weeks ago we got turned on to the excellent but sadly defunct UK duo Nosferatu D2 [item here]. Now that we've had time to do a little more looking into things, we've learned that Nosferatu D2 was the successor to an earlier trio dubbed Tempertwig. The band as far as we can tell is simply Nosferatu D2 with a bass player and guitar pedals. The added elements take the introverted, hard conflagration of Nosferatu D2 and turns its taut, relentlessness outward, releasing in big crescendos the energy that seethes in the music of the latter band. 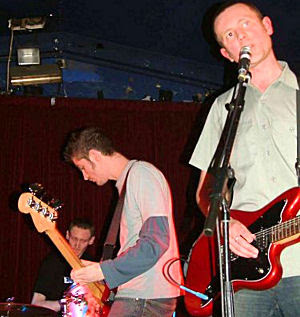 Anyway, there are four Tempertwig tracks available gratis at a Last.FM page for the band here. We recommend them all, but the one that sticks with us most is the track "This Means Everything, This Don't Mean A Thing," which we're posting below. Tempertwig -- "This Means Everything, This Don't Mean A Thing"
>> An interesting note at the bottom of Sunday's New York Times profile of the classical label Naxos. "[T]he company is branching out into indie rock because it’s the passion of [the principles'] son, Henryk." Given the label's singular way of doing things -- which has made it perhaps the strongest classical label going -- it will be interesting to see which indie acts it champions and how it markets them. Read more here. >> Sticking with the New York Times today: author Simon Reynolds' main criticism here of the new Joy Division biopic "Control" is inherently flawed. Mr. Reynolds takes director Anton Corbijn to task for framing the narrative of the film around Ian Curtis' marriage; Reynolds would prefer that Joy Division's story be couched in its "sociopolitical context." That's would be all well and good -- except that the film "Control" is based on the book "Touching From A Distance," a biography written by Deborah Curtis, Mr. Curtis' widow. Certainly "Control" could have included the context Mr. Reynolds yearns for. But it is hard to fault Mr. Corbijn for adhering to the text upon which his movie is based. >> Two things we love about the new teevee program "Chuck": the use of Spoon's "Don't Make Me A Target" in the second episode, and the fact that the dude from the insanely awesome 1980 movie "My Bodyguard" is in it. >> A Message For Kevin Drew. You've got J Mascis guesting on the hottest track on your solo record, and then you leave his guitar -- nay, all the guitars -- way down in the mix? Missed opportunity to put some rock on your very nice but occasionally rock-anemic set. Just sayin'.